Structural steel is nearing completion for the first phase of The Fenway Center. Two new residential buildings are rising that will feature a total of 312 apartments and 200 underground parking spaces. The project will also include ground floor retail and a landscaped pedestrian walked over Yawkey Station. The development team is expecting occupancy of Phase 1 in the first quarter of 2020. Two tower cranes are in place and framing has started for the first phase of the Fenway Center. This part of the project will include 2 mixed-use buildings to hold 312 apartments and around 37,000sf of ground floor retail space. Construction on Phase 1 is expected to be complete in early 2020. The $600M project will also add significant green spaces, pedestrian-friendly walkways, and an elevated streetscape, enhance this corner of the Fenway neighborhood. Fenway Center will also feature one of the largest private solar power plants in MA, and the MBTA's first net-zero-energy train station. Matt Edlen of Gerdling Edlen tells BLDUP via email that they have completed earthwork on the site and have started working on the garage foundation. The $240 million Phase 1 of the project will feature 2 residential buildings totaling around 340,000 sf. The underground garage now in process will include 200 parking spaces. Construction on Phase 1 is expected to be complete in early 2020. In total, the Fenway Center development will cost around $600 million and contain 1.1-million-square-foot of mixed-use space including approximately 550 residential units, 160,000 square feet of office space and over 50,000 square feet of retail. Site work is underway on Phase 1 of the Fenway Center in Kenmore Square. This first phase of the $600 million project is set to include two residential buildings containing 312 units and around 37,000 sf of retail space. Construction on Phase 1 is expected to be complete in early 2020. Three additinoal buildings will then be constructed for phase 2 including a 27 story mixed-use building, a 111K sf residential building and a parking garage. In total the Fenway Center project will bring around 550 residential units, 160,000 sf of office space, and 50,000 sf of retail to the neighborhood. Fenway Center joint venture partners Gerding Edlen, TH Real Estate and Meredith Management have signed a $21 million long-term ground lease with the Massachusetts Department of Transportation (MassDOT) for Phase I of the project and secured over $136.5 million in construction financing through The Union Labor Life Insurance Company, allowing construction of the project to begin after years of delays. Construction of the $240 million Phase I is scheduled to begin immediately, with a groundbreaking ceremony planned for mid-January. Starting the week of Monday December 11th, logistics for Phase I’s construction will begin to be put in place on site. Phase I of Fenway Center will take two years to construct, with completion expected in early 2020. Phase I will feature two buildings with 312 apartments, 37,000 square feet of ground-floor retail and 200 underground parking spaces. A 12,000-square-foot air rights deck and landscaped pedestrian walkway will also be constructed over Yawkey Station as part of the project. Upon full completion, Fenway Center will represent a $600 million investment in the Fenway neighborhood, generating $5.7 million in property taxes per year. The project will feature a total of approximately 550 residential units, 160,000 square feet of office space and over 50,000 square feet of retail, in addition to over 30,000 square feet of park and green space. Discussions are ongoing between Fenway Center's developers and MassDOT regarding the lease agreement for Phase II of the project. The developers are required to close the Phase II lease by December 2020. Developers John Rosenthal and Gerding Edlen have been granted an extension through the end of September to finalize their 99-year state lease for the Massachusetts Turnpike air rights necessary to build the 1.1-million-square-foot Fenway Center, which is now expected to start construction work this Fall. Initial preparation work could commence as early as September on the $230 million first phase of the $590 million, two-phased project. The first phase will be constructed next to the Massachusetts Turnpike on existing parking lots bounded by Beacon Street, Maitland Street and Yawkey Way. The developers and the state had originally faced a June 30th deadline to finalize the lease; however, appraisals of the property took longer than expected. In an interview with the Boston Herald, State Transportation Secretary Stephanie Pollack said the state agreed to extend the deadline to September given that the developers have been “meeting milestones and getting things done,” and that there has been “a lot of progress in recent months.” The developers will pay the state $21 million once the lease is finalized. Fenway Center will feature five buildings containing approximately 550 residential units, 160,000 square feet of office space and over 50,000 square feet of retail, in addition to over 30,000 square feet of on-site park and green space and 1,290 parking spaces. 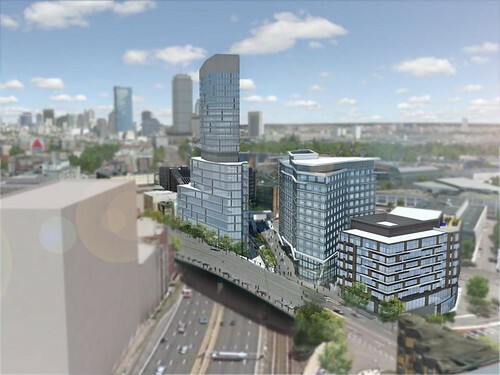 At last night's board meeting, the Boston Planning & Development Agency (BPDA) approved minor changes to the $580 million Fenway Center development project in the Fenway neighborhood. Approved changes include increasing Building 1 by 6,000 square feet, reducing Building 2 by 6,000 square feet and 17 residential units, increasing Building 3 by 58,000 square feet, decreasing Building 4 by 2,000 square feet and decreasing 6,000 square feet of above-ground parking garage space. Universal Hub reports that the Fenway Center development team has secured financing for the $230 million Phase 1 of Fenway Center, comprised of Buildings 1 and 2, and that the two buildings are expected to start construction in Spring 2017. "We are truly ready to go," said developer John Rosenthal at last night's board meeting. Fenway Center developers Meredith Management and Gerding Edlen submitted a Notice of Project Change (NPC) to the Boston Redevelopment Authority (BRA) earlier this month proposing changes to the approved Fenway Center development plan; the following is a link to the NPC. Fenway Center would now be constructed in two phases. Phase 1 would include two residential buildings (Buildings 1 and 2) of 7 and 13 stories, respectively, containing a total of 339,000 square feet. Phase 2 would include a 27-story, 375,000 square mixed-use office and residential tower (Building 3) and a 7-story, 111,000 square foot residential building (Building 4) that would be built on an air rights deck above the Massachusetts Turnpike. All four buildings at Fenway Center would have ground-floor retail space. Phase 2 would also entail the construction of a 7-story, 274,000 square foot parking garage on the air rights deck. With the most recent NPC, minor changes in planned square footage have been made since the NPC approved in September 2011; building heights have not changed. Most notably, 58,000 square feet have been added to Building 3 (part of Phase 2), which would be built atop the air rights deck, and Building 2 (part of Phase 1) has been reduced by 56,000 square feet. Altogether, Phase 1 has been decreased by 50,000 square feet, and Phase 2 has been increased by 50,000 square feet. After the proposed changes, the entire project’s proposed square footage remains at 1,099,000 square feet as approved in 2011. Per the NPC submission, the development team hopes that the proposed square footage changes will make Fenway Center more readily financeable, allowing for the completion of Phase 1 financing and commencement of construction in Spring 2017. The development team hopes that the proposed increase in Phase 2's density will make Phase 2 and the associated air rights deck more financeable and attractive to future equity partners and hopes to commence construction of Phase 2 in 2018-2019. The NPC is currently under review by the BRA. The Boston Globe reports that the Fenway Center development team has raised funding necessary to construct two new apartment buildings at Fenway Center containing 313 residential units. Financing deals have been signed with two large investors, and a total of $230 million has been raised. Construction of the two buildings could start by the end of 2016. A total of five new buildings are planned for Fenway Center; the project will cost nearly $600 million to build. The development team is now proposing to construct Fenway Center in two phases. The first phase would include the two new apartment buildings and would be constructed on the existing surface parking lots along Beacon Street. The second phase would include three additional buildings and would be constructed above the Massachusetts Turnpike on a new decking. Construction of the first phase would take approximately two years. The development team hopes to start construction of the decking above the Massachusetts Turnpike towards the end of construction of the first phase. The new two-phased approach would require approval from the Massachusetts Department of Transportation (MassDOT). The current agreement between the development team and MassDOT calls for construction of the decking over the Massachusetts Turnpike as part of the project's first phase. Per project developer John Rosenthal, MassDOT officials have been receptive towards the proposed change. Rosenthal hopes that successful completion of Fenway Center's first phase will raise capital and attract investment necessary to construct the second phase over the Massachusetts Turnpike. More information about Fenway Center is posted below.